*** Please note that anything with a * has been kindly gifted to me with no expectation for a review and any links marked with a ~ are an affiliate link which you can click if you wish to support the running costs of my blog. They do not effect how I feel about a product and all my opinions in this are my own honest thoughts on the product. When it comes to suncreens, there is no doubt that the Aussies take suncare VERY seriously. With a country that basically adopts the outdoors/beach lifestyle and is known for harsh summer sun, Australia possibly has some of the toughest sunscreen laws in the world. Due to these tough sunscreen laws, its actually VERY hard to find something in the country that is cosmetically elegant, doesn't give a whitecast and a product that doesn't smell like SPF. Enter Mecca Cosmetica (a company known for stocking some of the best brands in beauty), who created their own line of sunscreens and their To Save Face SPF50+ Superscreen has got to be one of the best value, cosmetically elegant and potent sunscreens I have ever found. The Mecca To Save Face SPF50+ Superscreen applies so easily on the skin. This creamy formula applies like a mid to lightweight moisturiser and sinks in so very quickly on to the complexion. The cream itself has a pale blush tone and does not leave a white cast on application. It feels quite weightless on and I love the fact that this dries down to a semi matte finish. Makeup sits quite well over this, I have found that this hasn't pilled with any of my foundations or tinted moisturisers. When using this I found that this has a pleasant scent to it that isn't over powering and most importantly doesn't smell like sunscreen. I also don't mind using this when I exercise due to its lightweight formula and the fact I feel that this doesn't congest my skin. I find that it generally stays put if I am out and about doing a bit of exercise and also fares well under the heat and humidity. I also find that I will always reach for this sunscreen if I know I will be in the sun all day (ie. beach) as I know that this will protect me relatively well in comparison to the other sunscreens I own. The To Save Sunscreen is an absolute dream to use for its effectiveness, price and overall the way it sits and feels on my skin. There is a reason why this is one of my favourites and why I have been using this religiously over the past 2 years. Retailing at AUD$40 for 75ml, To Save Face can be purchase from the Mecca online store or at Mecca boutiques. It is probably one of the cheaper/better value sunscreens on my list and it seriously is worth every penny (and is available for International Shipping too). Tatcha is one of those skincare brands that just get skincare textures so incredibly right and their Silken Pore Perfecting Sunscreen is no exception to this. Out of all the sunscreens that I write about in this post, the Tatcha Silken Pore Perfecting Sunscreen is high on my list of favourites in terms of texture and how it wears with makeup throughout the day. The Tatcha sunscreen feels a little heavier to begin with but as you work this into the skin, it starts to sink in and feel completely weightless and it leaves no white cast. The scent of this sunscreen is also pleasant, there is no strong sunscreen scent, it instead is more a light floral fragrance - a smell I much prefer over that SPF scent! What makes Tatcha's Silken Pore Perfecting Sunscreen so very different from the rest is that this sunscreen sits beautifully underneath makeup and helps my makeup last on some of the most sweltering hot days. Tatcha's sunscreen is more like a sunscreen and primer in one, it helps to smooth, even out and blur small imperfections in the skin to create a fantastic base for foundation. I find that my foundation applies perfectly over the top of the Tatcha sunscreen, it doesn't pill or flake off, it instead glides over the skin like silk to create that perfect base. I also have found that my makeup lasts a little longer (read...it doesn't melt off as easily) when I wear this underneath makeup. Sure I will look like a hot sweaty mess by the end of that day, however, my foundation seems to stay in tact for longer when using this. Whilst the Tatcha Silken Pore Perfecting Sunscreen does not have a high SPF (it is at 35 instead of 50), I don't use this when I know I am outdoors all day. I like using this as a day to day sunscreen where I will mainly be indoors most of the day but will be outside walking to get from A to B.
Tatcha Silken Pore Perfecting Sunscreen can be purchased from the Tatcha website~ and Sephora USA for USD$65 for 60ml. Active Ingredients: Avobenzone 2.00%, Homosalate 8.00%, Octinoxate 7.50%, Octisalate 5.00%, Oxybenzone 5.00%. Out of all the sunscreens mentioned today - the purlisee Blue Lotus Essential Daily Moisturiser quite possibly might be the most hydrating out of the lot. This product acts as a sunscreen and moisturiser in one and is perfect for those who just want to cut the extra layers in their skincare routine. Whilst the purlisse Blue Lotus Essential Daily Moisturiser has an SPF of 30, the brilliance in this formulation is quite simply - how hydrated it keeps the skin without the greasy or 'tacky' feeling. When this applies on to the skin, I find that this melts into the complexion without leaving a white cast but also works to well to plump the skin and keep all other skincare 'locked' into the skin. It also dies down to a fairly semi-matte/matte finish and also works well underneath makeup. When applied, the purlisse Blue Lotus Essential Daily Moisturiser has a very feint smell of sunscreen (its very light) and the scent does disappear upon application. What I enjoy about using the purlisse sunscreen is the fact it really is one of those great sunscreen/moisturisers (just make sure you apply plenty of the product) in one due to its hydrating and nourishing formula. I feel that when I apply this over my skin, it really works so well to lock everything else applied in but keeps my skin plump, hydrated and looking healthy. It gives my skin enough moisture without looking or feeling greasy. Overall I love this formula on those no makeup days (ie. on holiday!) and when my skin is feeling a little dry as it gives my skin that little bit of extra nourishment and TLC. The purlisse Blue Lotus Essential Daily Moisturiser can be purchased online from purlisse for USD$55 for 50ml. For those who are looking for a comfortable mineral sunscreen without the white cast - the Farmacy Beauty Green Screen Daily Environmental Protector is a great product to look into. With a formula comprised of 2.4% Titanium Dioxide and 5.82% Zinc Oxide, this formula is perfect for those who like to opt more for a physical sunscreen that is more cosmetically elegant. Farmacy's Green Screen is feels relatively lightweight when applied on to the skin, leaves a semi matte finish, smells a little bit of honey and most importantly does not leave a white cast. It simply melts into the skin to protect the skin from the sun's UVA and UVB rays. I find that Green Screen feels quite comfortable on the skin and doesn't seem to interfere with the skincare products underneath or the makeup applied over top. Whilst this does feel a little heavier than most of the sunscreens mentioned in this post, it still is lightweight in the scheme of other sunscreens I have used in the past. It is however very comparable to the Tatcha sunscreen as I found that this does work quite well as a primer as it does have a semi matte finish that provides a nice smooth surface for foundation. I personally did prefer the Tatcha sunscreen a little more as I found this to feel a little heavier and in the heat, lightweight textures are key for me personally. However, the price point of the Farmacy Green Screen is fantastic. It is almost half the price of the Tatcha, and both products are also quite comparable in the way they perform and leave the skin looking and feeling. It's a fantastic purchase as it does work well to keep the skin protected and acts so wonderfully as a day to day sunscreen. It also works well underneath makeup to help create a flawless base in the summer sun and heat. The Farmacy Beauty Green Screen Daily Environmental Protector can be purchased from Farmacy Beauty online or from Sephora for USD $36 for 50ml. The CLE Cosmetics Radiant Skin CCC Cream is not a sunscreen but more a BB/CC cream that sort of does everything in one and does it very well. I love the CLE CCC cream for its amazing coverage, blurring powers and also the fact that it has a relatively high SPF (SPF45 in USA standards). This unique formula comes in 5 different shades and will at first appear white when squeezed out of its tube. The magic starts to happen as the CCC cream is worked into the skin, the white slowly starts to adjust the colour of the skin giving a buildable and very natural looking light to medium coverage of the skin. It gives a beautiful dewy finish to and blurs out my imperfections (like scarring) on the skin. I absolutely love the coverage of this as its just enough to keep the skin looking natural but it covers quite well. I find that this formula has wonderful staying power and will usually last the whole day. My only complaint about this is that is does leave a slight white cast on my skin, but this is easily rectified for me as I will wear my NARS Hydrating Tint on top which takes away that white cast and leaves my skin with a beautiful golden glow. The white cast does go away after 30-45 minutes but it does exist on initial application. Unlike most other foundations or colour coverage I use, the CLE Cosmetics CCC Cream looks better over time. I'm not really complaining. What I do love about the CLE Cosmetics Radiant Skin CCC Cream is the coverage it gives my skin and it ability to make my skin look almost perfect when it really isn't. The magic is in the blurring capabilities of the formula - those PIH marks or pesky spots look barely there when I apply this with medium coverage. My complexion seems to look much better when I use this and to be honest, I sometimes like using this more than my usual foundations due to its coverage and sunscreen capabilities. It sits well and doesn't pill underneath my daily skincare routine and overall, it does what it says it will do - give the skin that radiant, natural glow. The CLE Cosmetics Radiant Skin CCC Cream can be purchased from CLE Cosmetics online for USD$31 or from Cultbeauty~ for a 30ml. For those who love wearing absolutely next to nothing on their face and love a dewy complexion the Origins GinZing SPF40 Energy Boosting Tinted Moisturiser is something worth looking into. I love the lightweight but incredibly dewy finish this tinted moisturiser leaves. Like the CLE Radiant CCC Cream, the Origins GinZing Tinted Moisturiser comes out a greyish colour and then on application, adapts to the skin's natural tone. It provides a light coverage and its dewy finish gives my skin a soft, sunkissed glow. This tinted moisturiser works wonderfully to even out skin tone and provides some coverage of the complexion, it also works quite nicely underneath foundation - I actually like mixing this with heavier foundation to provide my skin with a little more coverage. 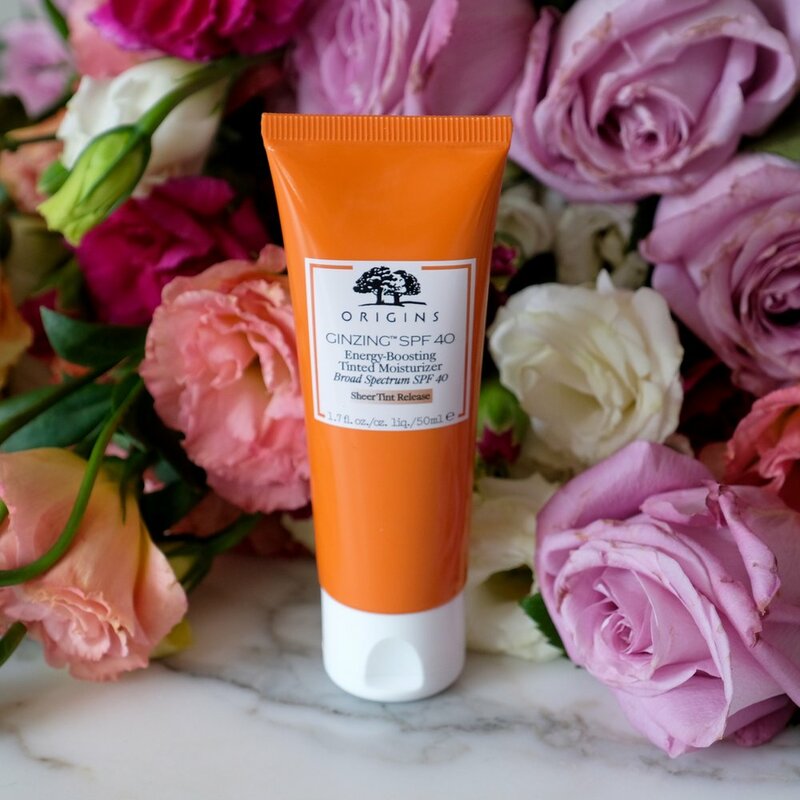 I find that I reach for Origins GinZing SPF40 Energy Boosting Tinted Moisturiser on those lazy weekends where I feel like I will need to duck out for just little bit. The finish and light coverage it provides is perfect for me, although I do think that those with slightly oilier complexions may need to test this first to see if they end up looking like a grease ball due to its dewy finish. The Origins GinZing Tinted Moisturiser does not smell like sunscreen but instead has a really pleasant citrus scent to it. It provides the skin with a little extra hydration and the addition of ingredients such as caffeine and ginseng in the formulation is supposed to give the skin a little bit of a boost. Whilst I can't say for sure if these ingredients do give my complexion an 'energising boost', I can absolutely vouch for the final effect that the Origins GinZing SPF40 Energy Boosting Tinted Moisturiser gives - a healthy, dewy and luminous complexion with the extra added bonus of a high SPF 40. The Origins GinZing SPF40 Energy Boosting Tinted Moisturiser can be purchased from Origins online or from Sephora for USD $38 for 50ml. Rationale is an amazing Australian cosmeceutical brand that is serious about skincare and have recently ventured in to creating colour cosmetics. Their Beautiful Skin Luminizing Superfluid was the first venture into this and it basically is a tinted moisturiser for the skin. In terms of coverage, this reminds me very much of Glossier's Skin Tint - its provides the most sheer coverage, just enough to even out skin tone but it doesn't really cover anything up. It a great product for those with perfect skin/good skin days or when on holidays and you need the sun protection but a little bit of colour for the face. The texture of Rationale's Luminizing Superfluid is serum like, it is very watery which makes it quite easy to apply on the skin and it feels quite weightless because of it. It gives a slightly dewy and radiant finish to the skin. I find that it best worn on its own and that it doesn't layer very well underneath other foundations as it will pill. I have sometimes tried to use this as a primer but often find it is hit and miss with certain foundations. This product really is meant to be worn on its own due to the pilling I have found in the past. Despite this, it provides my skin with the most sun protection as it is rated at an Australian SPF50, making it a perfect companion if I know I will be in the sun quite a bit. Its weightless texture makes it wonderful in the heat and is perfect for evening out skin tone on those good skin days. Rationale's Luminizing Superfluid is available at the Rationale online store or in Rationale boutiques and retails for AUD$85 for 50ml. What is your favourite sunscreen and why? Have you used any of these sunscreens before? I would love to hear you thoughts in the comments section below.